As technology evolves and customers’ requirements continue to shift, all areas of IT are impacted. For service providers in particular, there’s a lot of pressure coming from end users, customers, and the business to radically improve one critical area: the service desk. In order to meet expectations and drive high customer value, service providers themselves need an IT service management (ITSM) solution that improves the customer experience, their own agility, and profit margins. 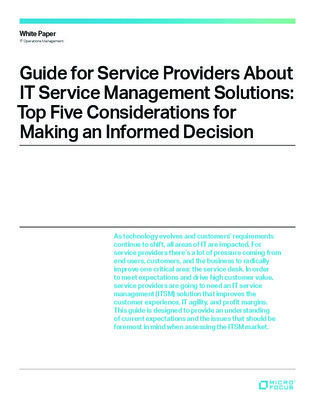 This service provider’s guide to ITSM is designed to present providers with an understanding of current customer expectations, the issues that should be foremost in mind when assessing potential ITSM solutions, and 5 criteria for selecting the right ITSM. Access your copy here.